The far superior and sought after MONO version, hear like you’ve never heard it before! They were the best of times for Jefferson Airplane, and the good vibes are heard throughout the band's iconic Surrealistic Pillow. The group's first album with vocalist Grace Slick and drummer Spencer Dryden, the 1967 effort bowed as the first psychedelic-rock breakout from the potent San Francisco scene, climbing to #3 and boasting two Top 10 singles. By bringing the then-unpolluted counterculture to the attention of the mainstream, the effort ranked by Rolling Stone #146 on its 500 Greatest Albums of All Time eradicated boundaries and opened up creative vistas for a parade of likeminded artists that followed. Mobile Fidelity's analog reissue honors this legacy with an edition that presents the groundbreaking music with incredible realism. Mastered from the original master tapes and pressed at RTI, Mobile Fidelity's 180g 45RPM mono 2LP set grants Surrealistic Pillow audiophile-grade sound remarkable for its sense of balance, clarity, and tonality. While fans have always preferred the original mono version of the LP, it went out of print soon after its release, causing prices to soar. Offering wider, deeper grooves for better information retrieval and superior pacing, this deluxe set gives listeners the chance to enjoy Jefferson Airplane's blockbuster set in faithful-to-the-original mono without having to pay a premium. Along with immersive detail and dynamics, the level of instrumental and vocal separation allows the sensory-altering songs' complexities to emerge with full-bloom color and renewed perspective. Mobile Fidelity puts the surrealism back into Surrealistic Pillow. Of course, the former model's two songs don't define Surrealistic Pillow – they merely reflect its kaleidoscopic brilliance. Slick and Balin duet to enchanting effect on "She Has Funny Cars." Stripped to its bare acoustic foundations, the mellow ballad 0"Comin' Back To Me" shimmers and whispers, a quaint recorder underlining echoing the yearning mood. Similarly quixotic, the instrumental "Embryonic Journey" hints at the possibilities explored throughout the album and particularly manifested on the gorgeously textured "Today," originally written for Tony Bennett. 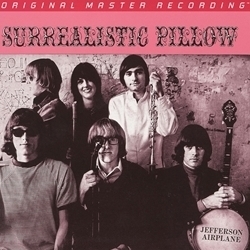 Inside these 34 minutes, Jefferson Airplane achieves sublime surrealism – and more.